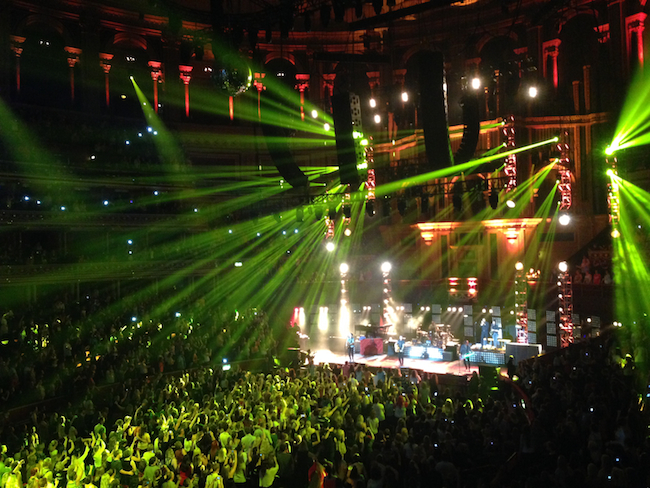 Last night we had a lavish jaunt to see McFly as they played the first show of a four night residency at the Royal Albert Hall to celebrate their tenth anniversary together. McFly really are THE finest and most brilliant band – one of our all time favourites in fact – ever, ever! A band we’ve grown up with, a band who we’ve seen live nine times across the years and that we never tire of seeing and a band who continue to develop and progress even after a decade together. Also, it’s not just that the music of McFly is so fantastical that makes them so enduring – it is that they are a loveable, genuine group of friends, which is so refreshing, infectious and admirable. Last night’s gig was an emotional rollercoaster of nostalgia – it was one of those occasions where we had to swallow hard and look at the ground in order to hold it together but it was entirely joyous, the heart swelled with enormous pride as the band rattled through material from their mighty back catalogue. 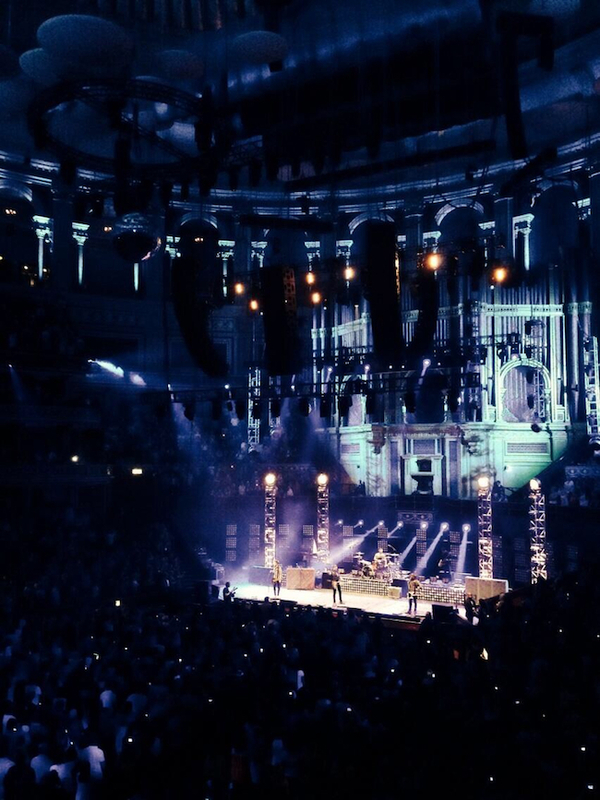 The venue made the evening all the more special – there was something in its grandness which elevated their performance and with all McFly gigs they ensured they pulled out all the stops. The show opened with a video montage of fans from across the globe and celebrity well-wishers such as Chris Moyles, Richard Curtis, Brian May and Keith Lemon offering messages of congratulations on the anniversary, before moving onto a dramatic, moody video piece of the boys preparing for the stage which gave rise to a colourful, typical tongue-in-cheek rendition of YMCA which set the tome for the evening perfectly. Danny, Tom, Dougie and Harry bound on stage and opened with an energetic performance of ‘Saturday Night’ before continuing with three additional tracks from their debut ‘Room On The Third Floor’ – it is a testament to the greatness of the songs that even after ten years, they sound as fresh and exciting as the day we all first heard them – their performance as enjoyable and as fun as it was in those days too. The show was split into rough sections which was signalled by further use of video montages much like the one used during the opening. One particular video message came from Chris Moyles ahead of a brilliant performance of ‘Star Girl’ which featured a live trumpeter. Another video showed Matt and James of Busted discuss the very beginnings of McFly before they appeared on stage to form the supergroup McBusted and sing their hits ‘Year 3000’ and ‘Air Hostess’, remaining to sing ‘Shine A Light’. It was a truly electrifying moment and one which is so typical of a McFly show – something that was out of the ordinary and unexpected. Other highlights included Dougie playing the organ during the introduction of ‘Transylvania’ and Danny’s live staple ‘Walk In The Sun’ sounded beautifully stunning across the hall. Another moment came when Tom debuted a song titled ‘McFly – The Musical’, which was a rousing solo piano led track about the history of McFly and what the band means to him. It was beyond AMAZING and a necessary moment to reflect and revel in his creative greatness. Danny, Dougie and Harry then joined him to close out the song – it was sensational – funny, heartfelt, humble and sincere. Following footage of their recent album recording sessions, the band premiered a new song which had a timeless McFly topline with a weighty sound, which also featured a fiddler! It was a different direction but one which sounded right for them and was met with great excitement and applause. The show was closed with touching tributes from the band to all those who made the lengthy pop careers possible and fans were treated to special dedications within adapted lyrics to the songs within the encore. It was such an amazing show – one which was truly special and unforgettably memorable, and one which show highlighted McFly’s unequivocal mastery. Here’s to the next glorious ten years!